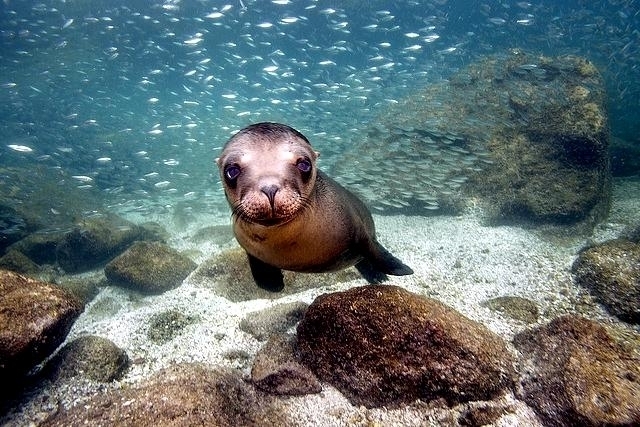 The California Sea Lion is a coastal pinniped of western North America. 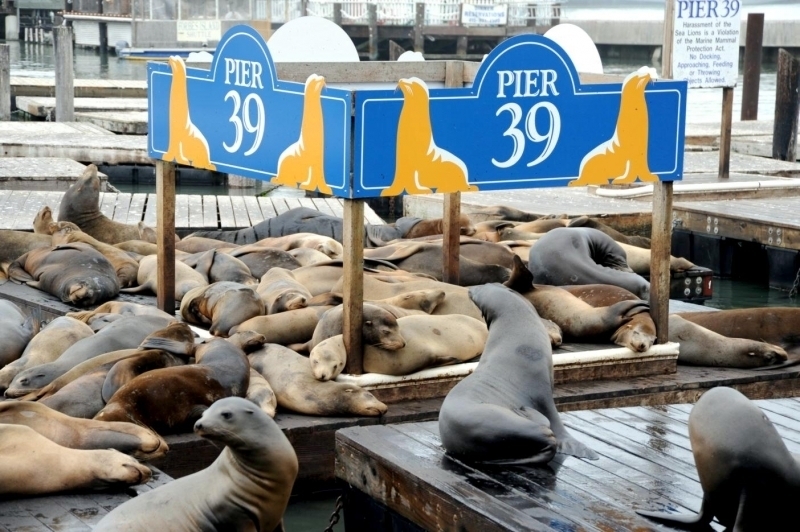 Their numbers are abundant and the population continues to expand at a rate of approximately 5.0% annually. 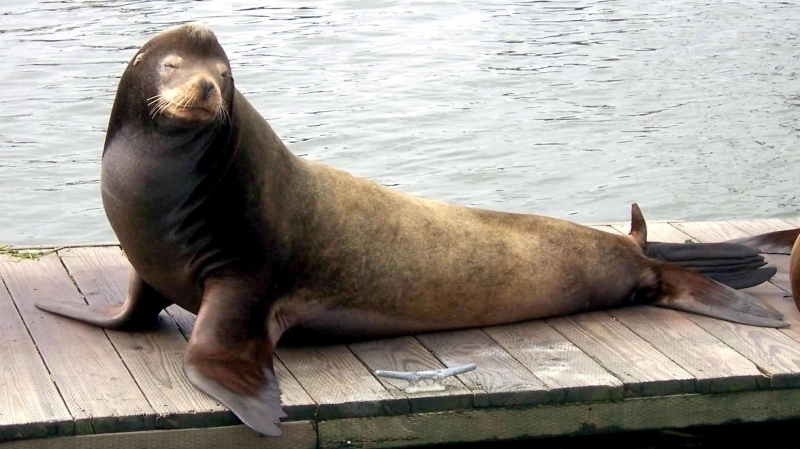 They are quite intelligent, can adapt to man-made environments and even adult males can be easily trained. 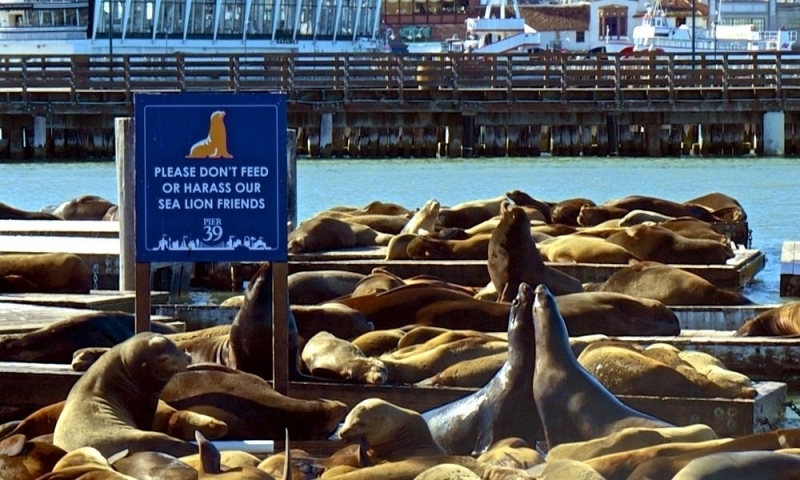 Because of this, California Sea Lions are commonly used for entertainment in circuses, zoos & marine parks and are used by the US Navy for certain military operations. 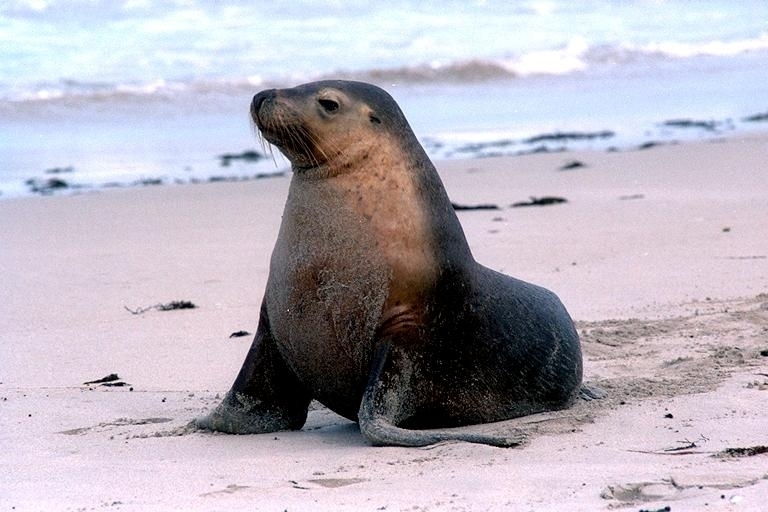 This is the classic circus “seal”, despite the fact that it is not a true seal. 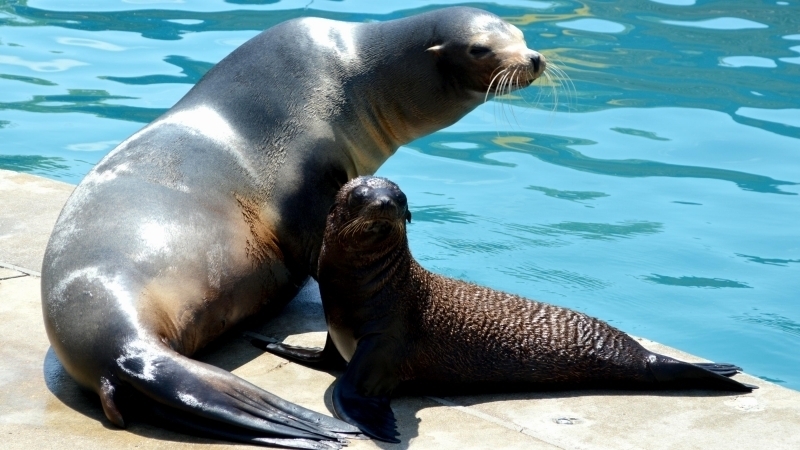 California Sea Lions grow to 300 kilograms (660 pounds) and 2.4 meters (8 feet) long, while females are significantly smaller at 90 kilograms (210 pounds) and 2 meters (6.5 feet) long. 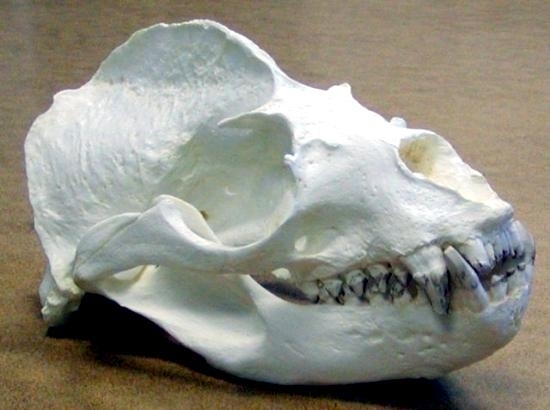 They have pointed muzzles, making them rather dog-like in appearance. 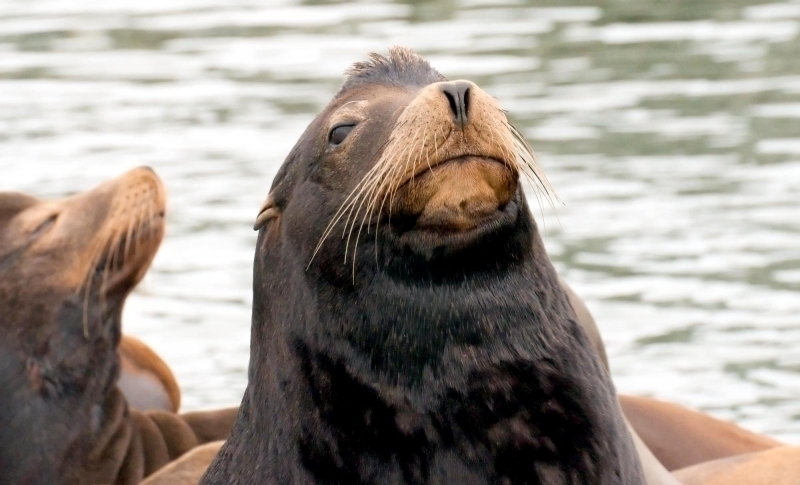 Males grow a large crest of bone on the top of their heads as they reach sexual maturity. 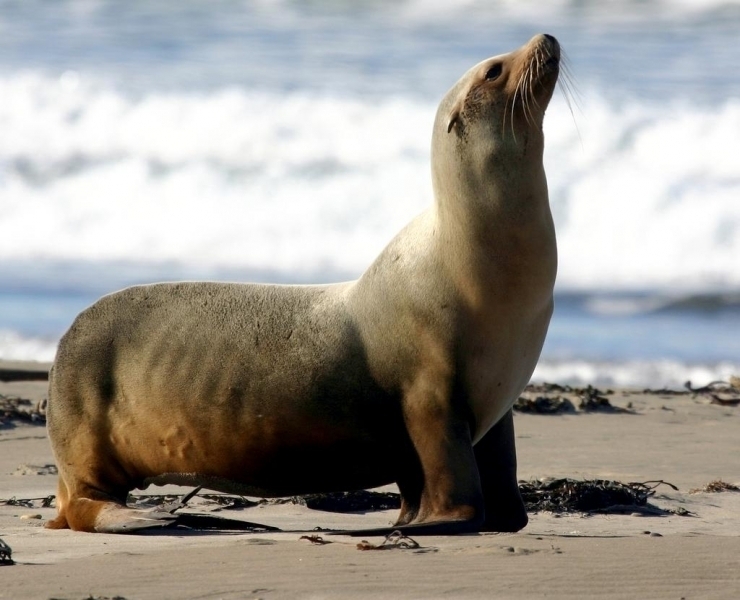 They also have manes, although they are not as well developed as the manes of adult male South American or Steller/Northern Sea Lions. 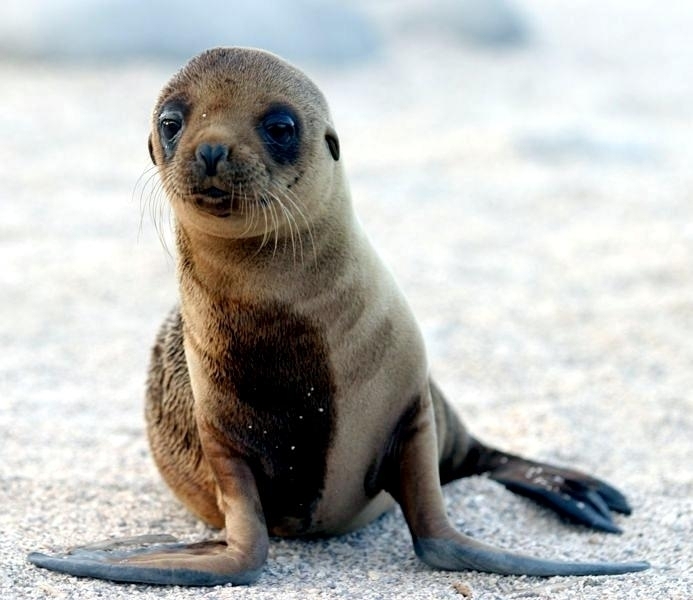 Females are lighter in color than the males and pups are born dark, but lighten when they are several months old. 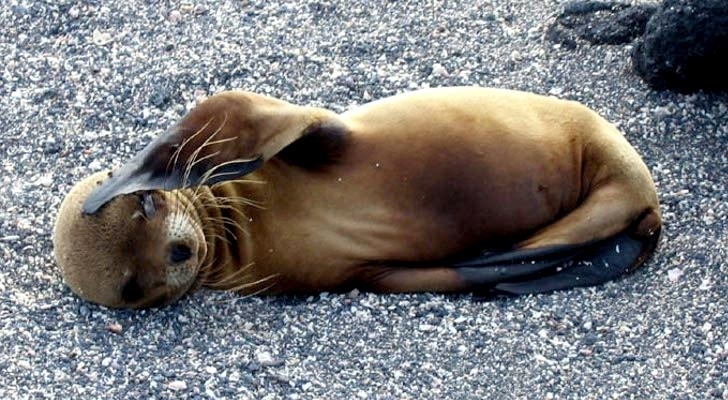 When it is dry, the skin is a purple color. 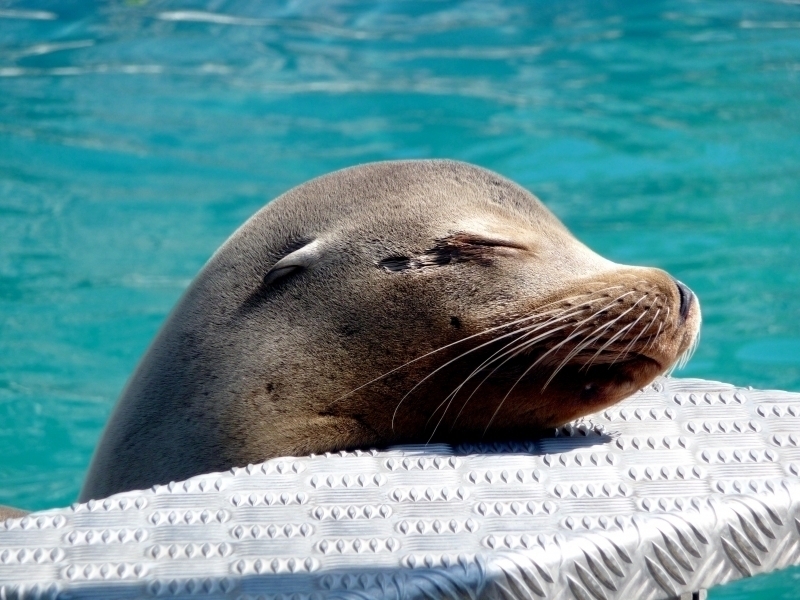 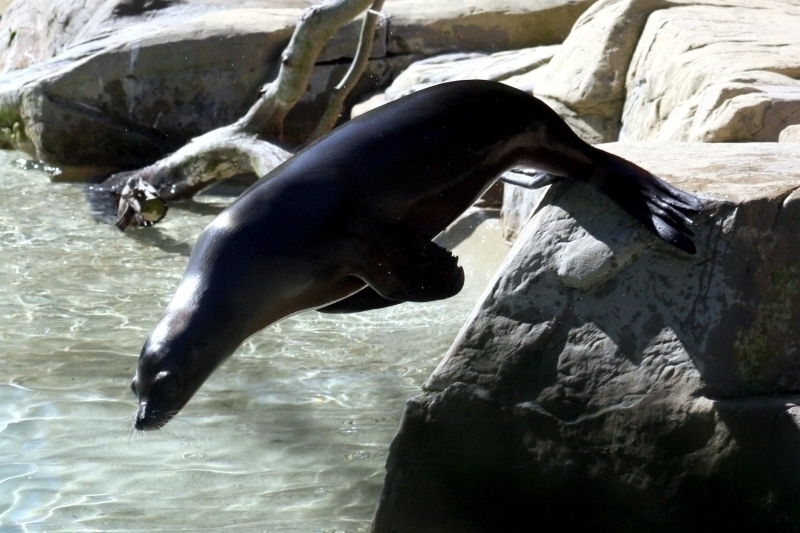 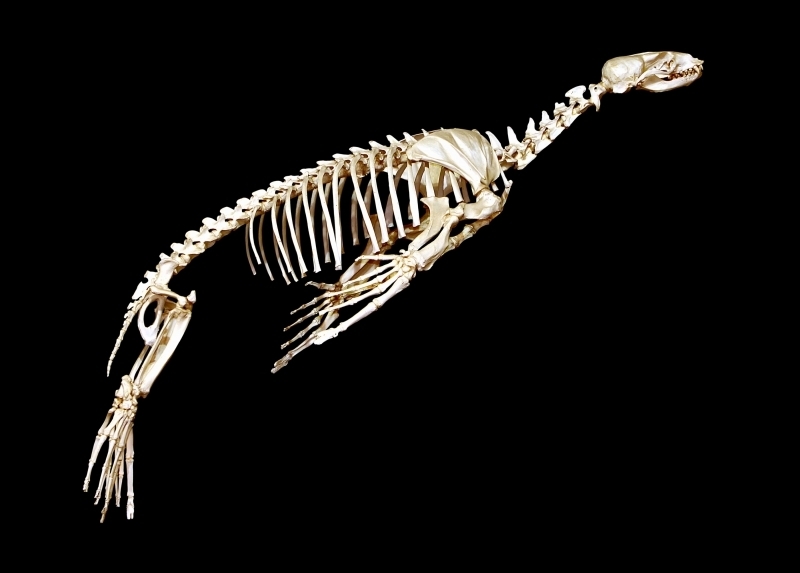 A California Sea Lion’s average lifespan is 17 years in the wild and longer in captivity. 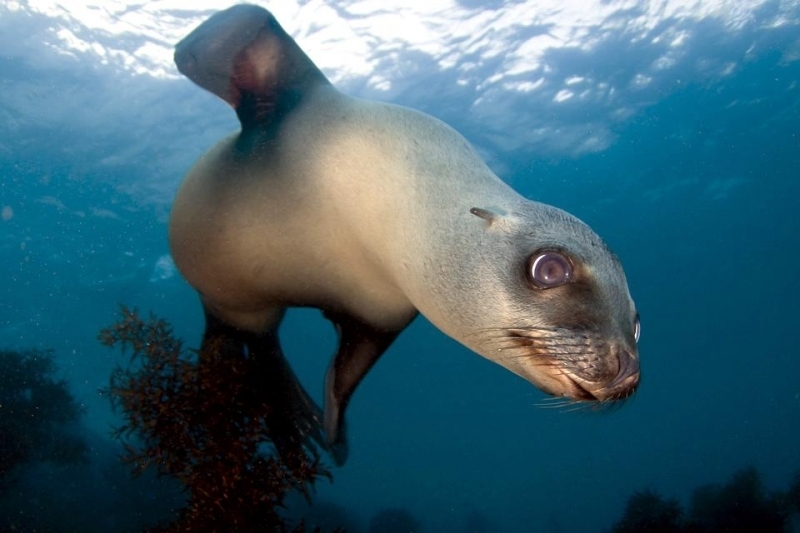 By sealing their nose shut, they are able to stay underwater for up to 15 minutes. 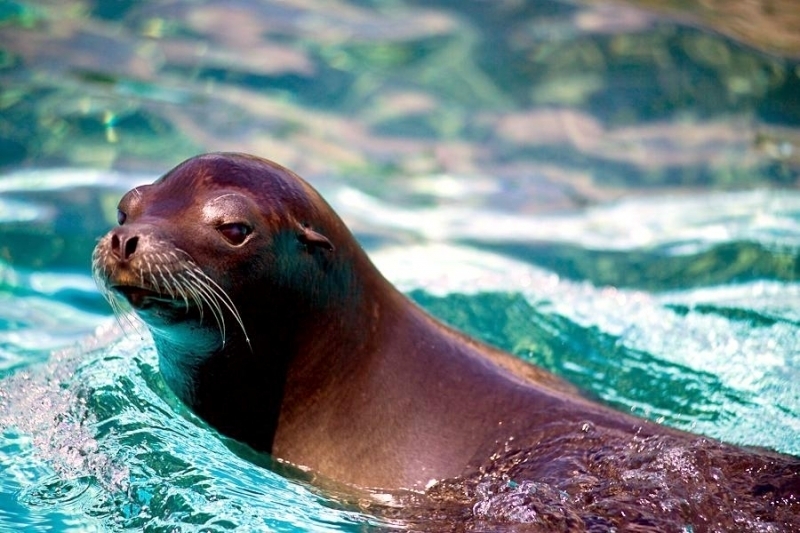 As its name suggests, the California Sea Lion is found mainly around the waters of California. 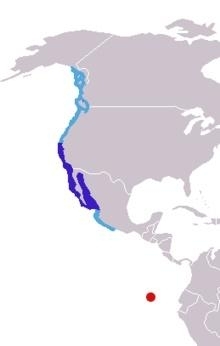 It also lives around Oregon, Washington and British Columbia to the north and Mexico to the south. 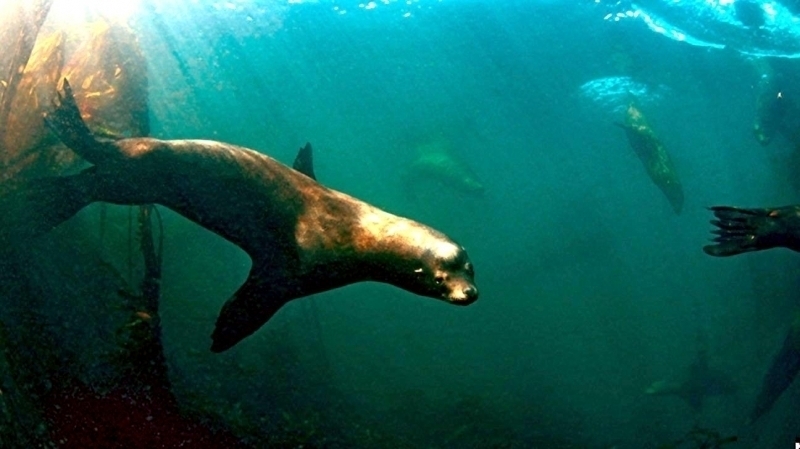 The Galápagos Sea Lion and the extinct Japanese Sea Lion were once considered subspecies of the California Sea Lion. 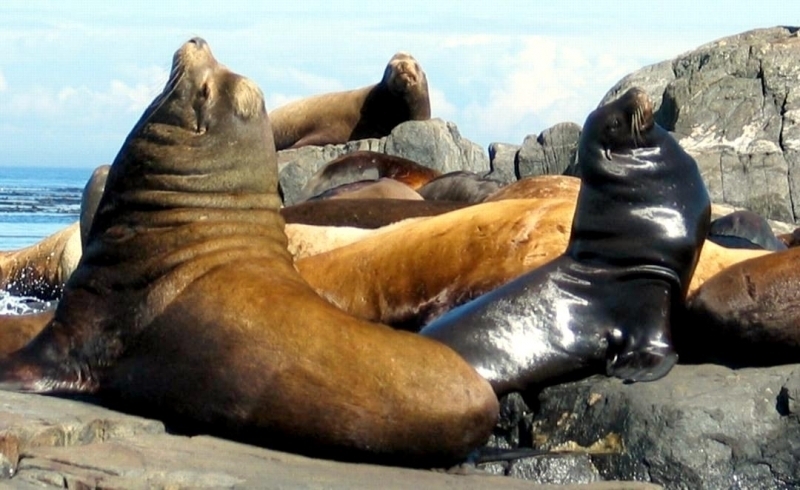 Now these two populations are generally considered as distinct species. 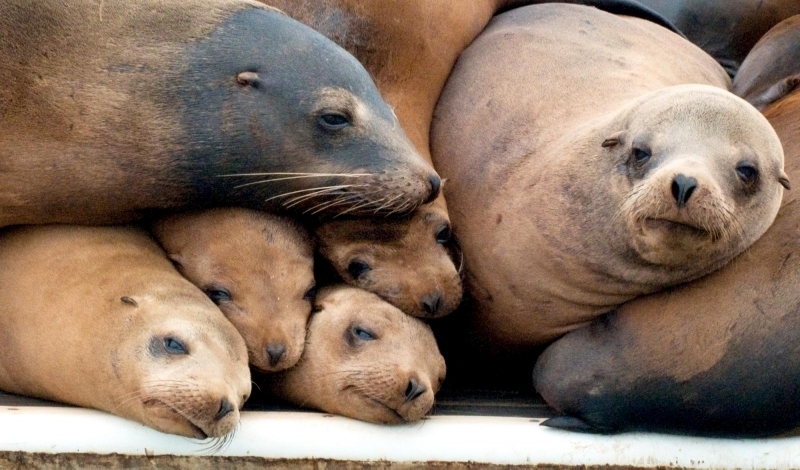 California Sea Lions breed from the Channel Islands off Southern California to Mexico. 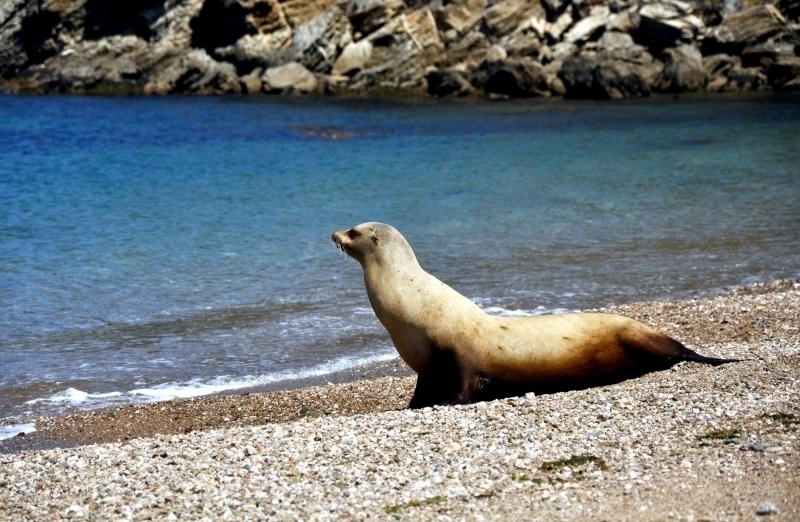 Major breeding sites are San Miguel and the San Nicolas islands. 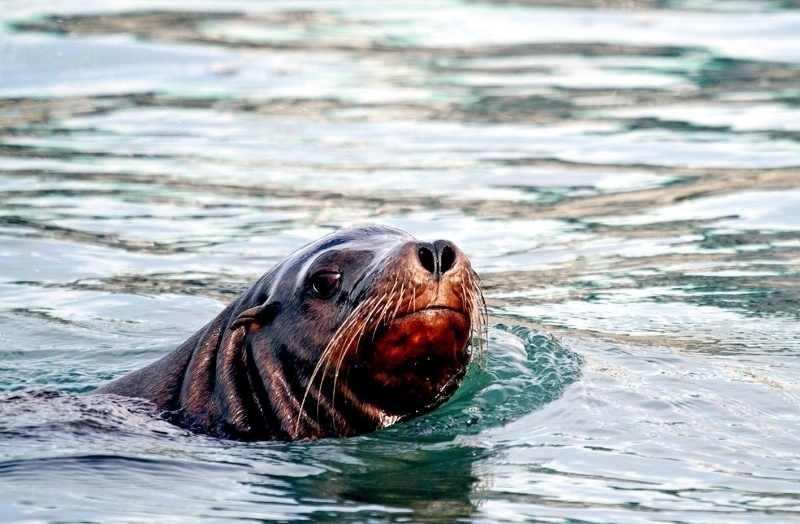 Non-breeding populations live as far north as British Columbia. 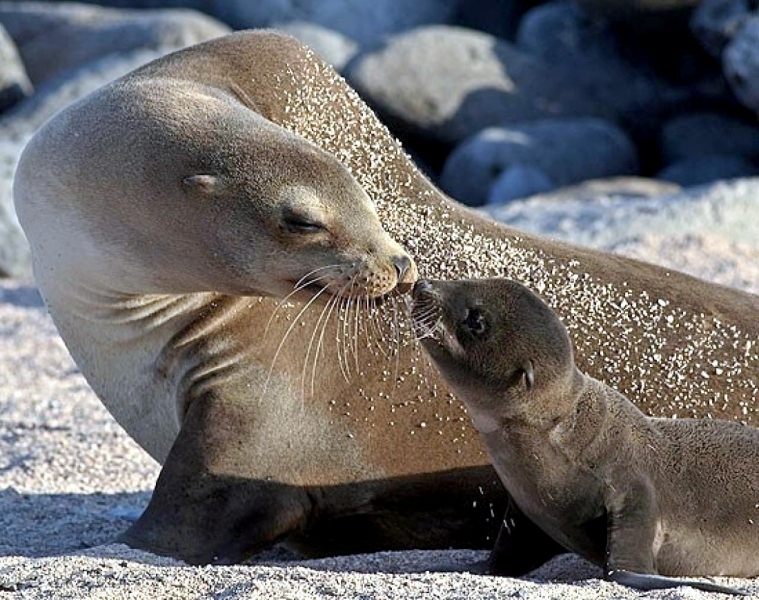 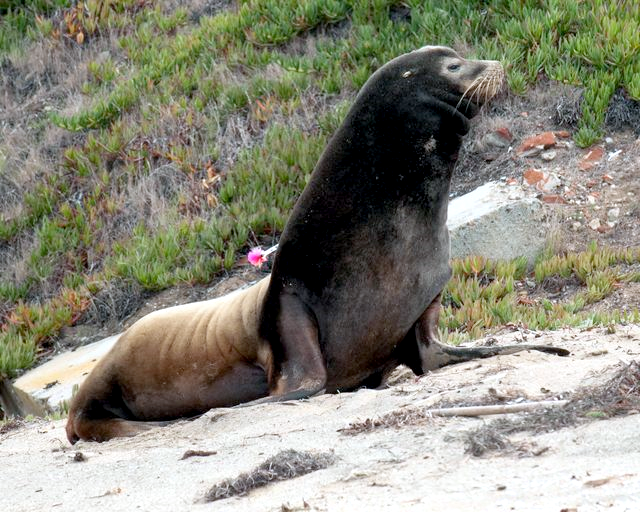 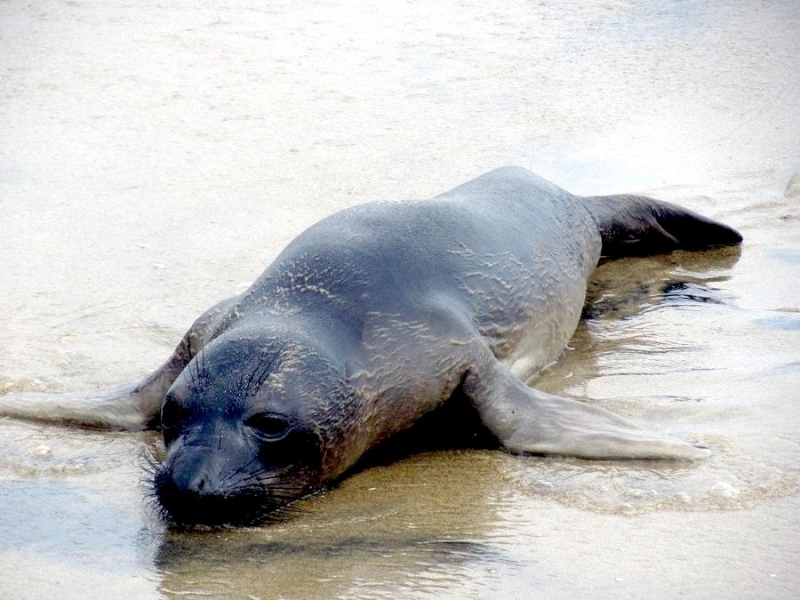 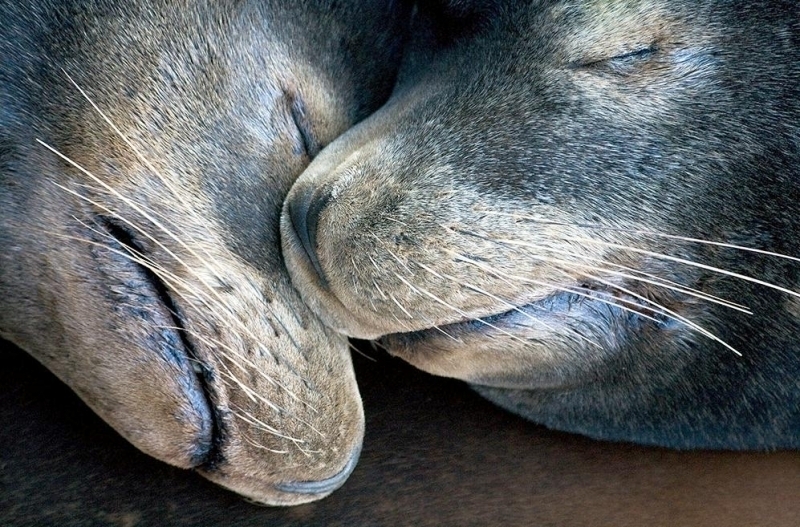 California Sea Lions prefer to breed on sandy beaches in the southern part of their range. 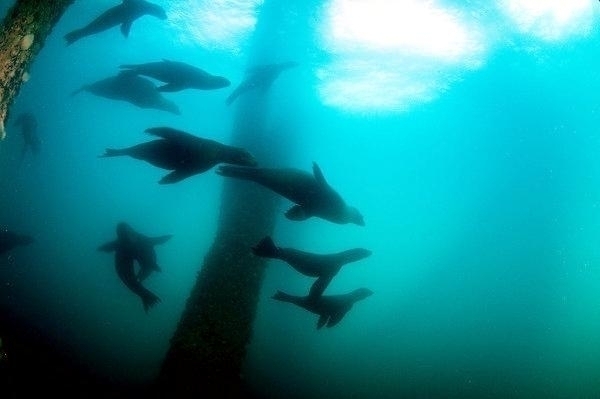 They usually stay no more than 10 miles out to sea. 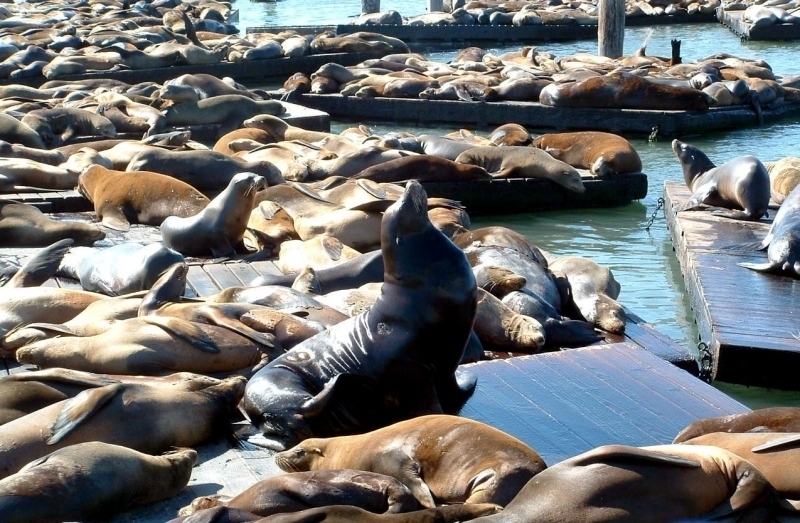 On warm days they stay close to the water’s edge. 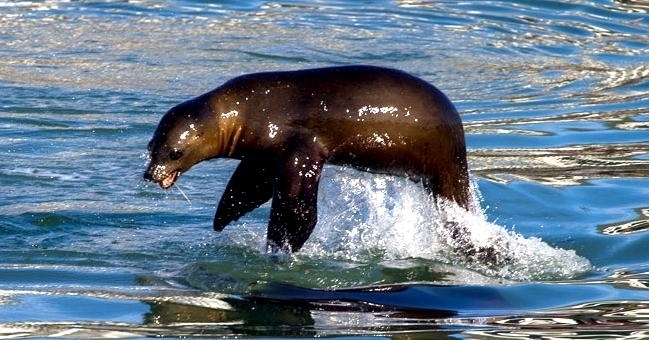 At night or on cool days, they will move inland or up coastal slopes. 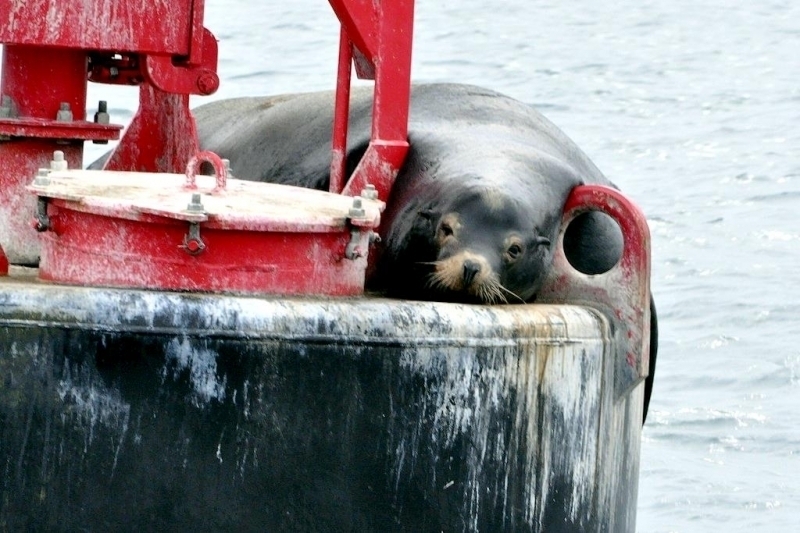 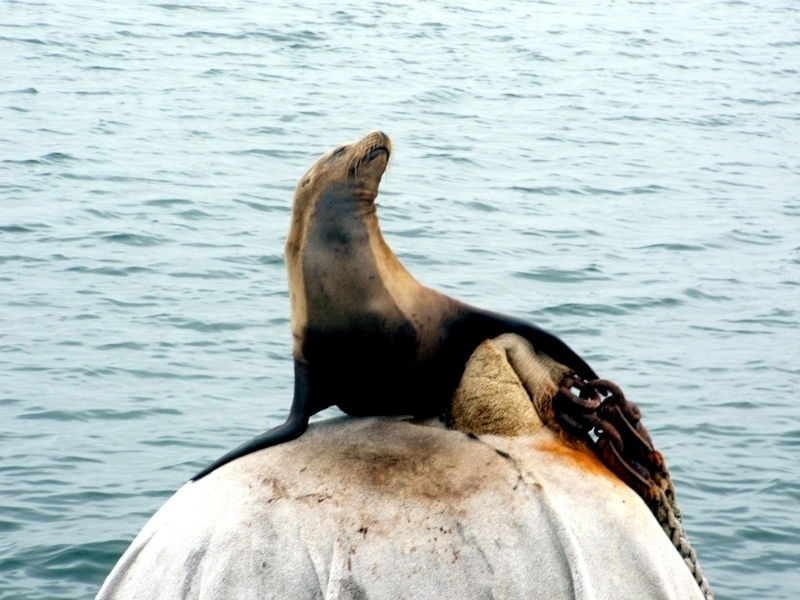 Outside of the breeding season they will often gather at marinas & wharves and may even be seen on navigational buoys. 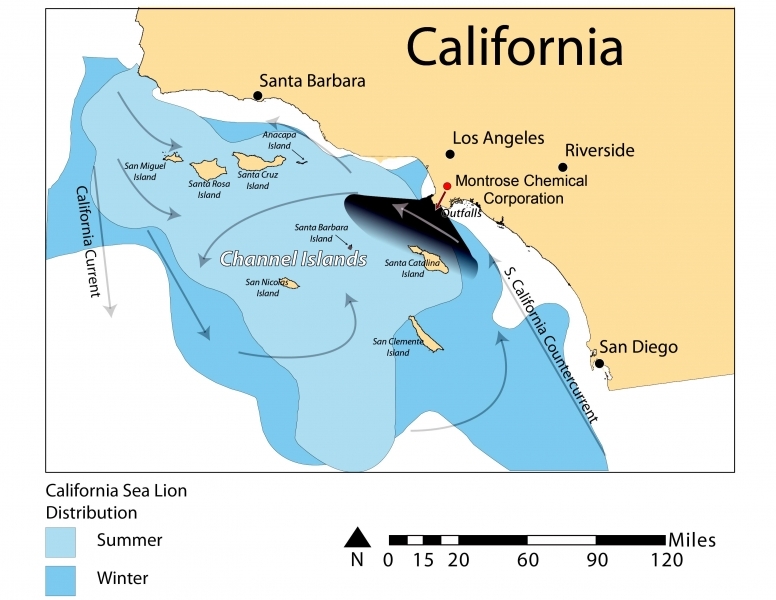 These man-made environments provide safety from their natural predators, the Killer Whales and Great White Sharks. 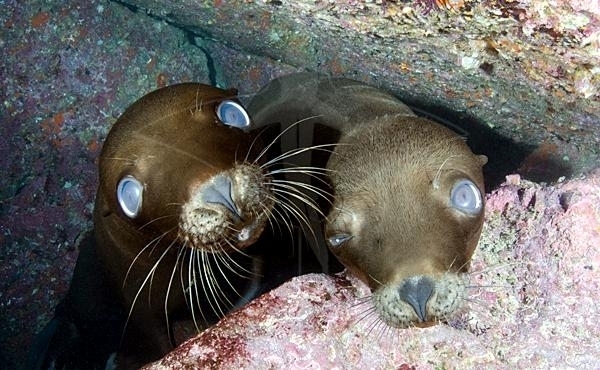 California Sea Lions can also live in fresh water for periods of time. 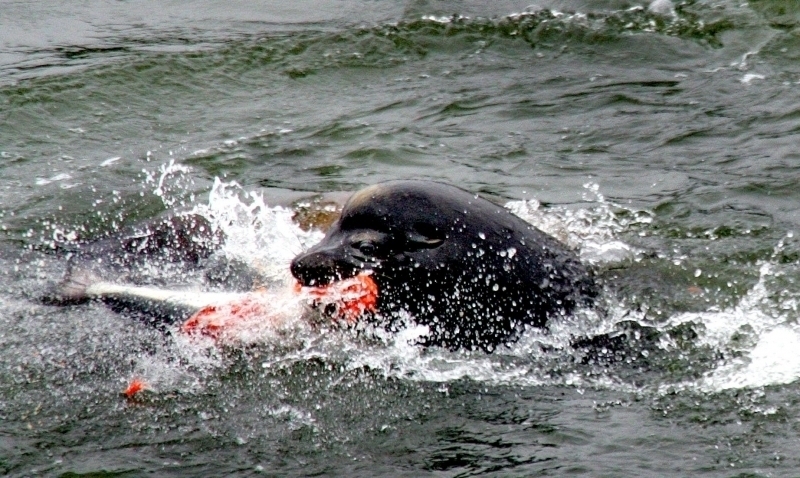 They feast on salmon in front of Bonneville Dam, 146.1 river miles from the Pacific Ocean. 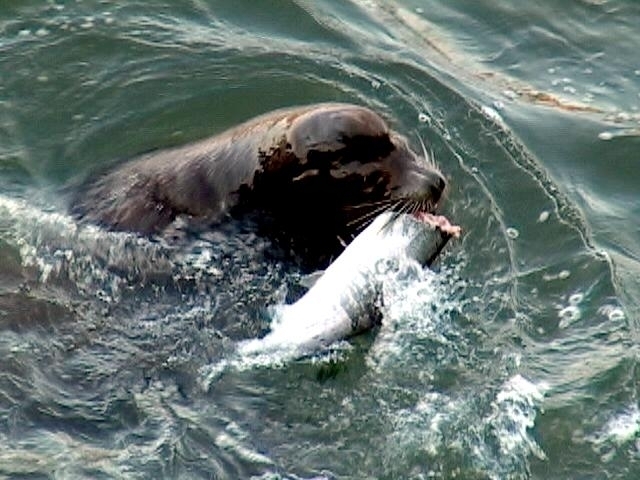 Historically, they hunted salmon in the Columbia River as far as The Dalles and Celilo Falls, 200 miles (320 kilometers) from the sea, as remarked upon by people such as George Simpson in 1841. 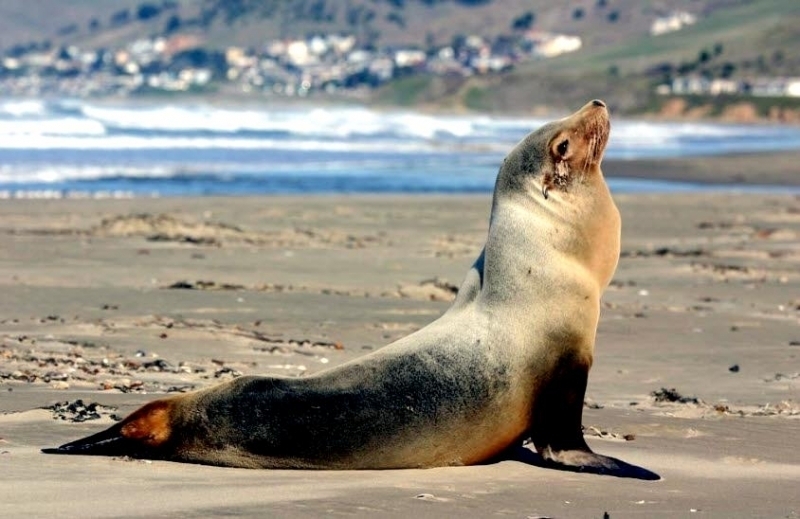 In 2004, a healthy California Sea Lion was found sitting on a road in California’s Merced County, close to 100 miles upstream from San Francisco Bay and a .5 mile from the San Joaquin River. 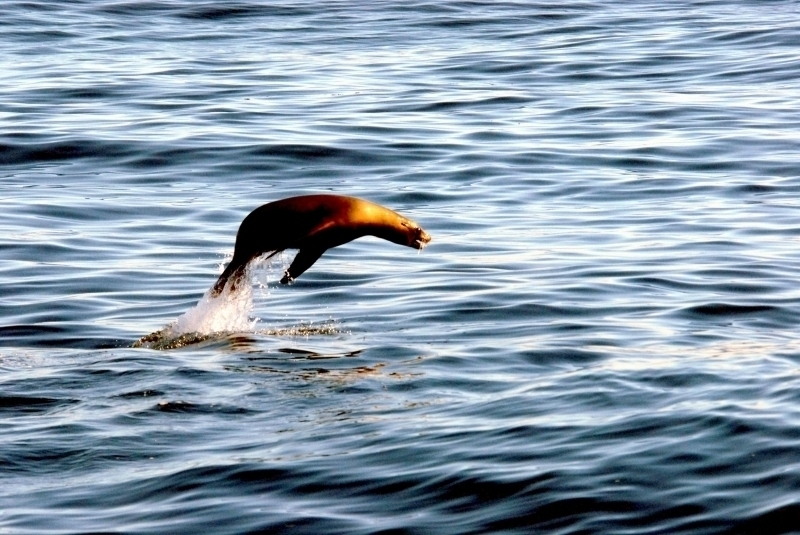 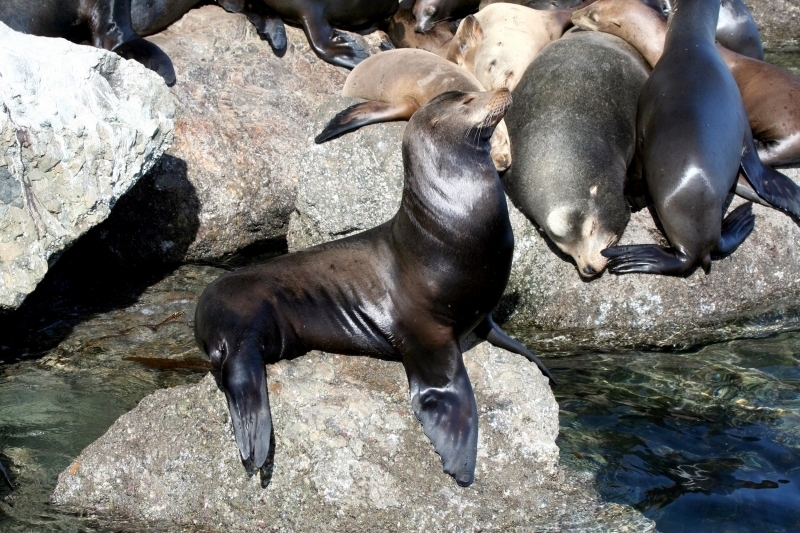 California Sea Lions feed on a wide variety of seafood, mainly squid and fish; sometimes even clams. 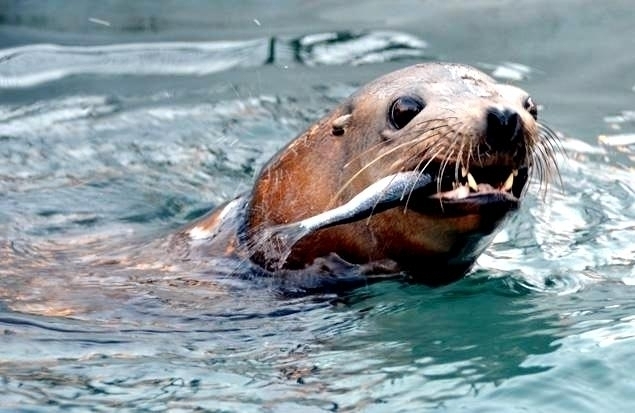 Commonly eaten fish & squid species include salmon, hake, whiting, anchovies, herring, schooling fish, lamprey and squid. 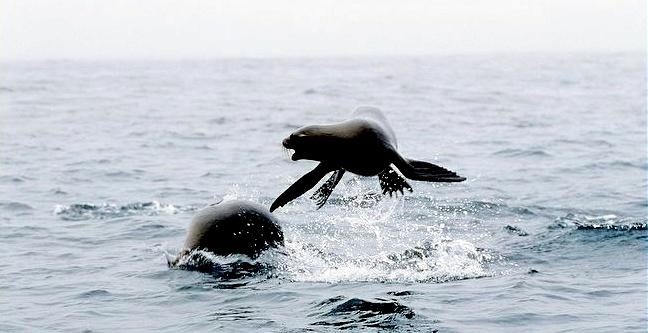 They feed mostly around the edge of the continental shelf as well as sea mounts, the open ocean and the ocean bottom. 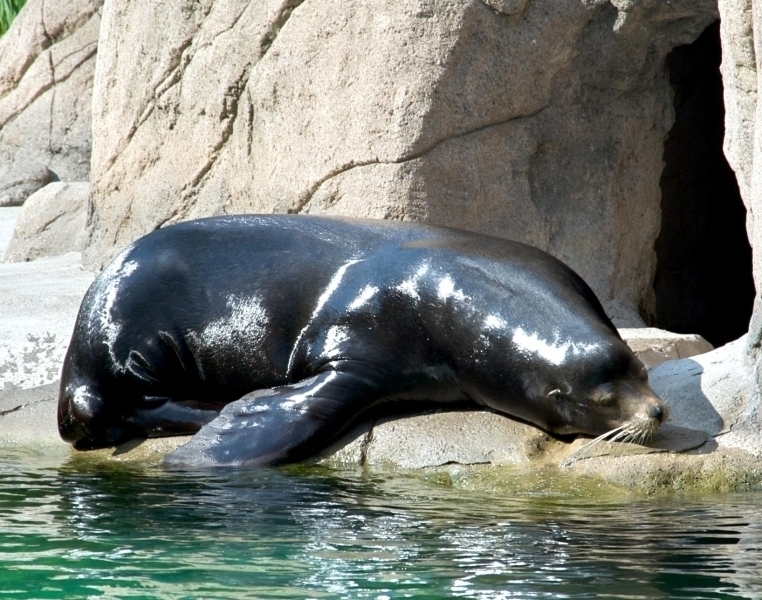 Average annual food consumption of males in zoos increases with age to stabilize at approximately 4,000 kilograms (8,818 pounds) per year by the age of 10 years. 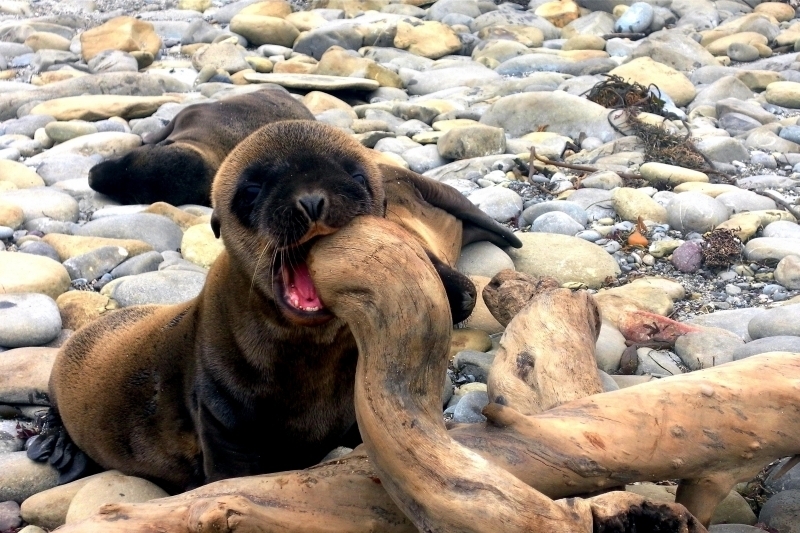 Females showed a rapid increase in average annual food consumption until they were 3 years old. 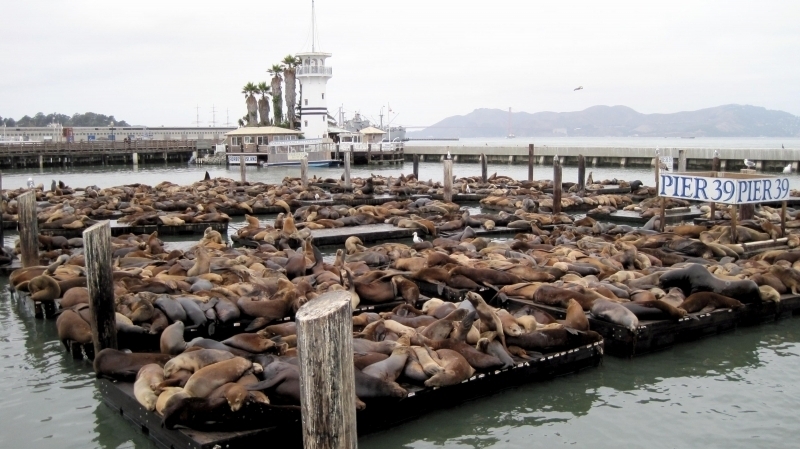 Thereafter, females housed outdoors averaged 1,800 kilograms (3,968 pounds) per year. 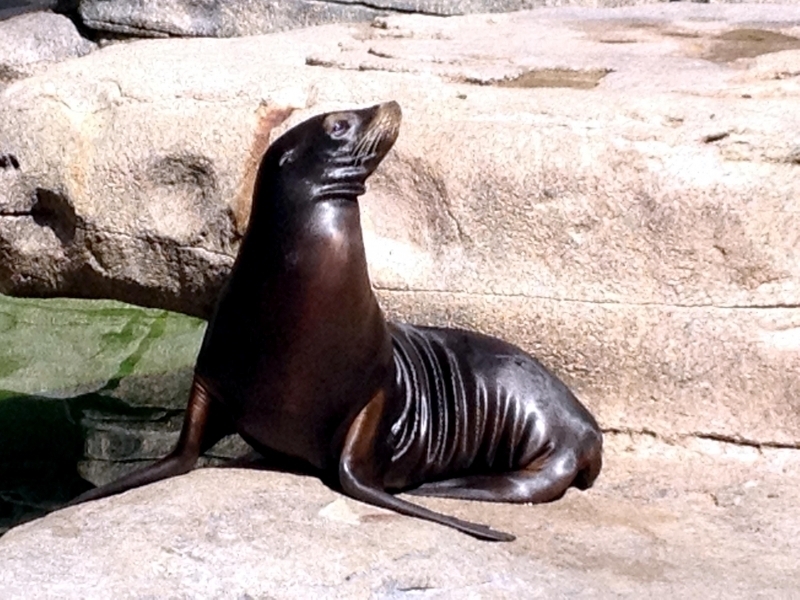 California Sea Lions may eat alone or in small to large groups depending on the amount of food available. 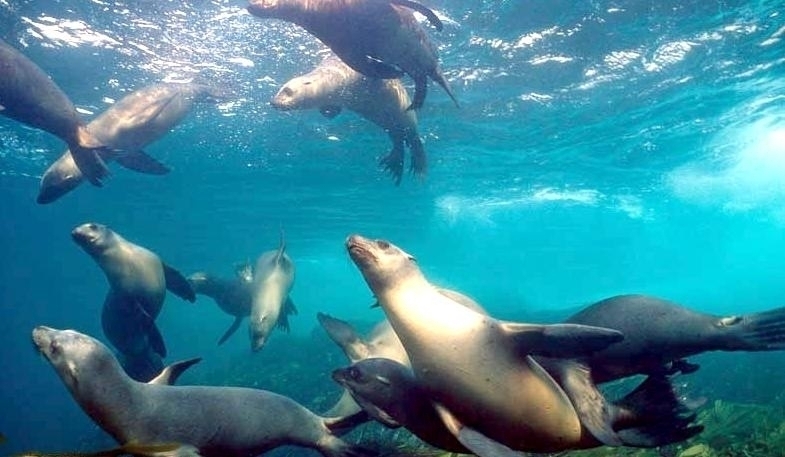 They will cooperate with dolphins, sharks and seabirds when hunting large schools of fish. 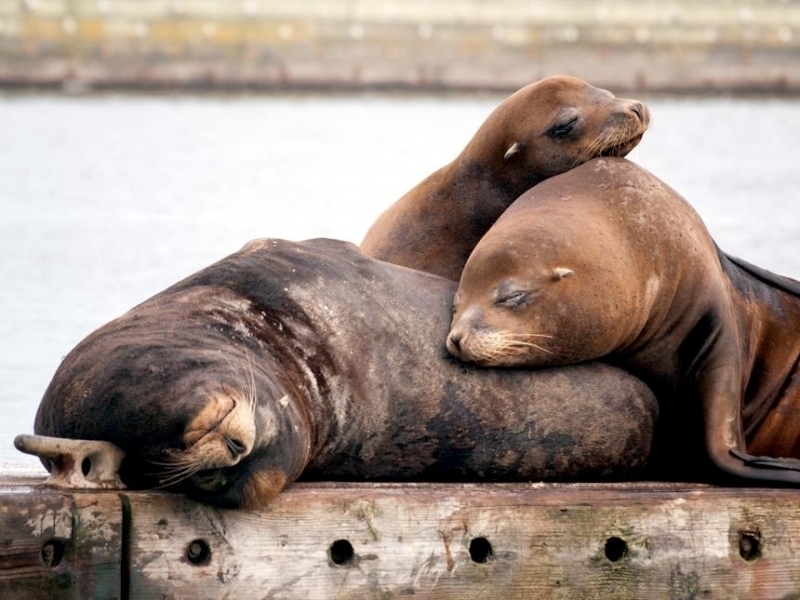 California Sea Lions from the state of Washington will wait at the mouths of rivers for the salmon run. 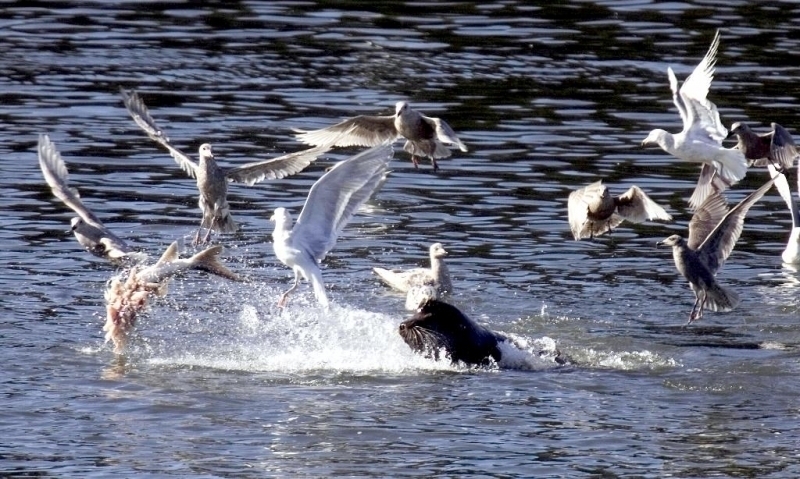 They also have learned to feed on salmon below fish ladders at Bonneville Dam and at other locations in the Columbia River, Willamette River and in Puget Sound. 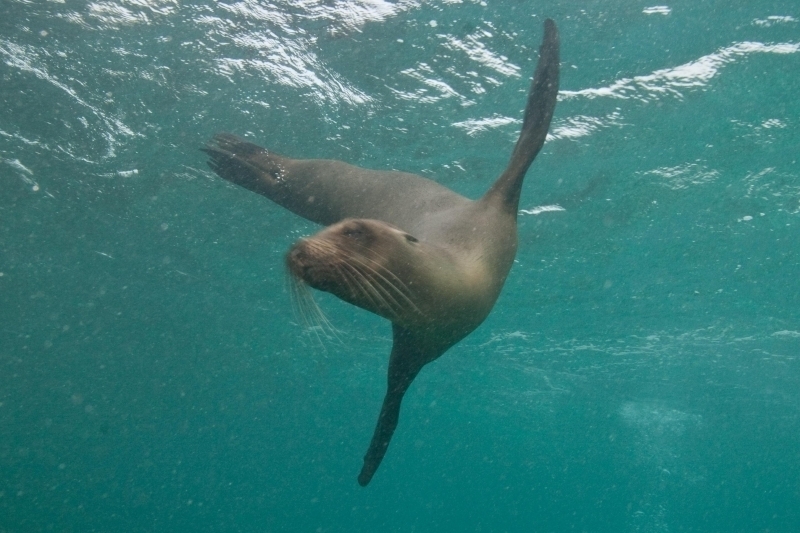 Adult females forage between 10 and 3,000 kilometers from the rookery and dive to average depths of 31.1 to 98.2 meters, with maximum dives between 196 and 274 meters. 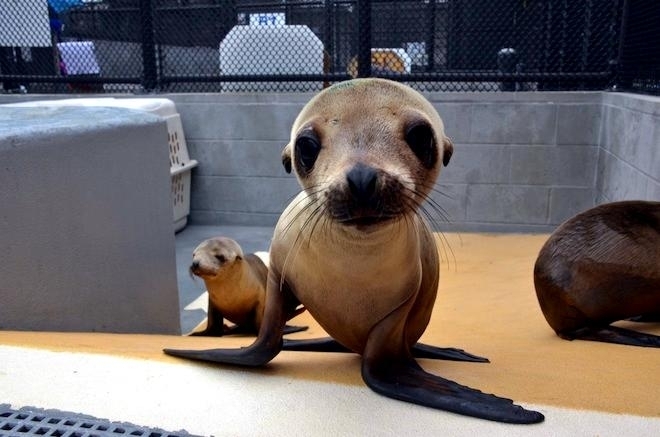 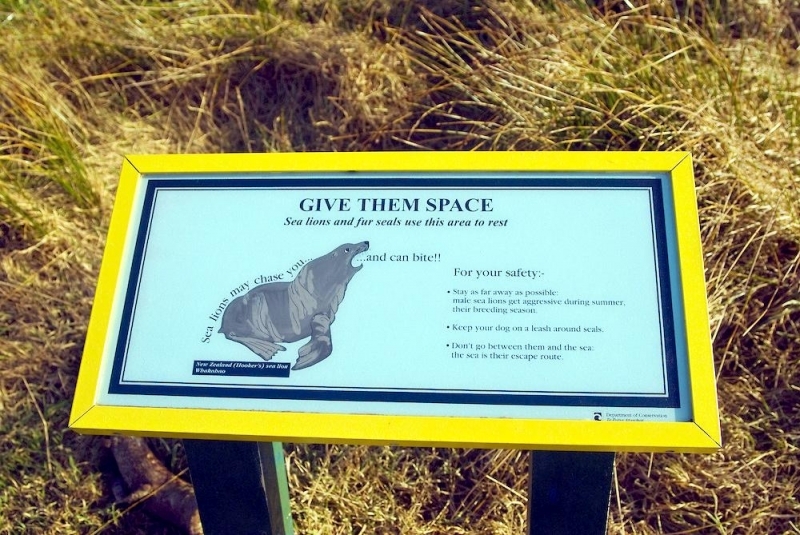 They travel at an estimated speed of 10.8 kilometers per hour and young California Sea Lions have an initial defecation time averaging 4.2 hours. 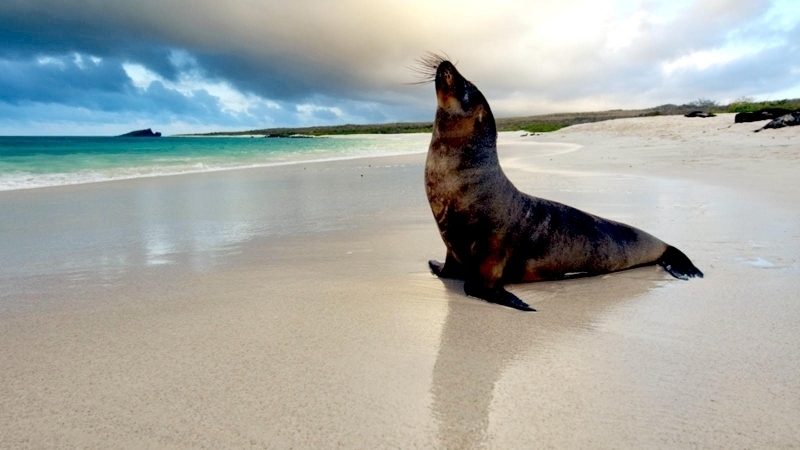 Adult females spend 1.6-1.9 days on land and 1.7-4.7 days at sea. 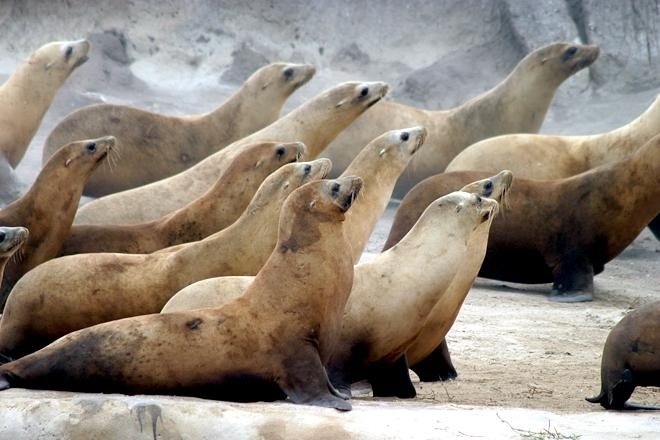 California Sea Lions are highly social and breed around May to June. 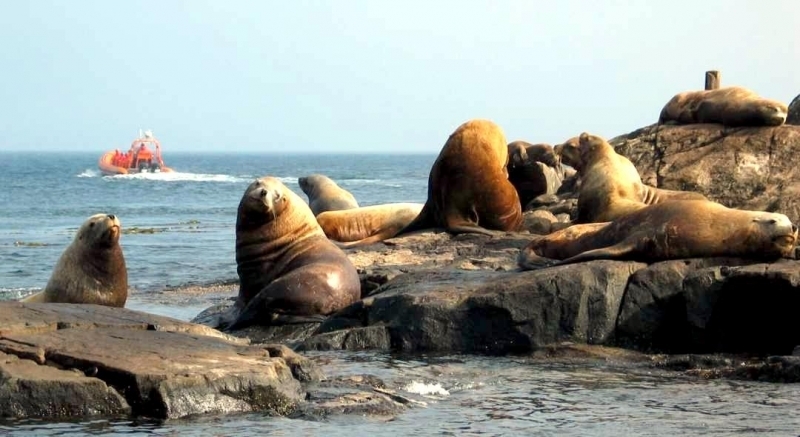 When establishing a territory, the males will try to increase their chances of breeding by staying on the rookery for as long as possible. 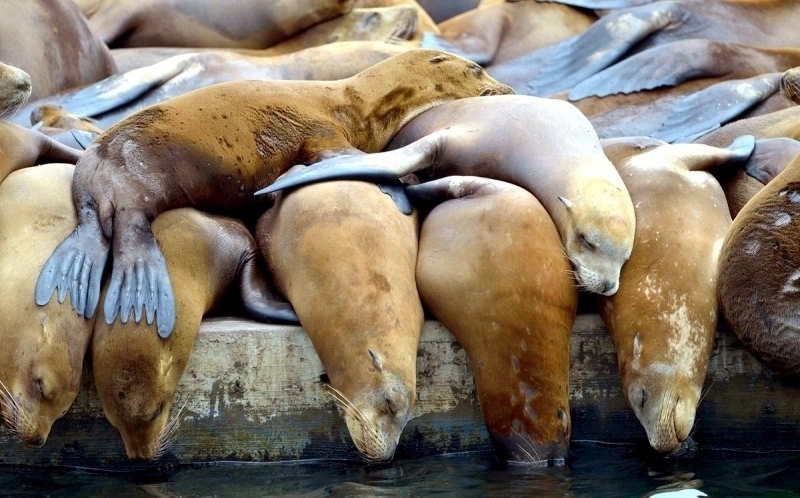 During this time, they will fast using their blubber as an energy store. 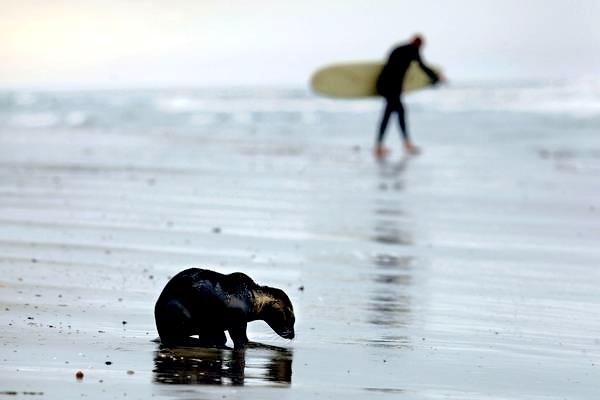 Size is a key factor in winning fights and well as waiting. 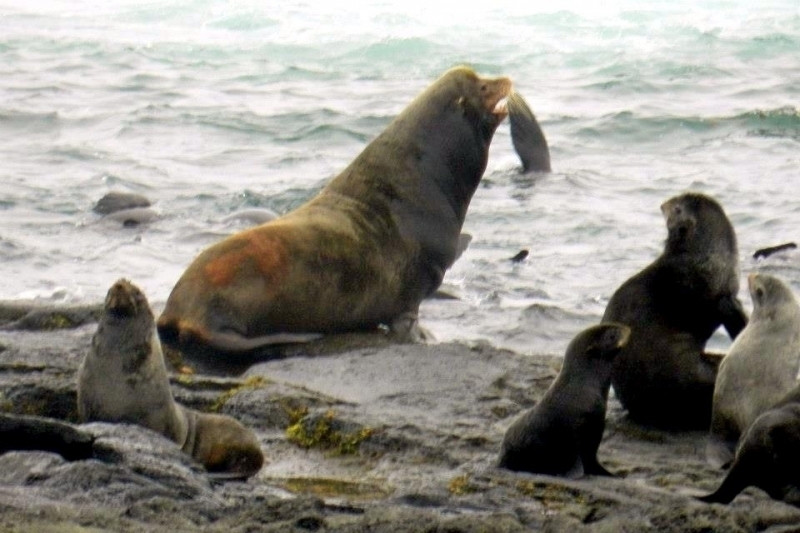 The bigger the male the more blubber he can store and the longer he can wait. 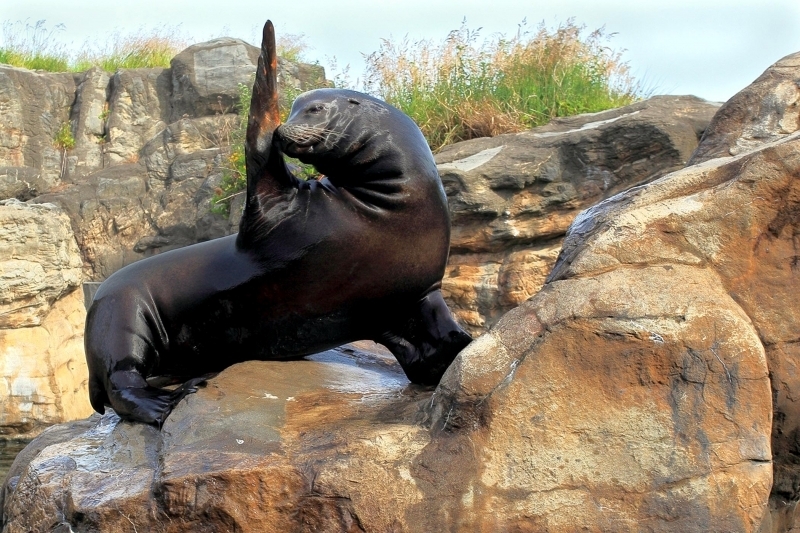 A male California Sea Lion can only hold his territory for up to 29 days. 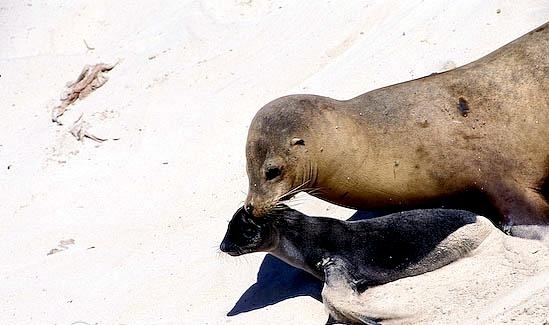 Females do not become receptive until 21 days after the pups are born, thus the males do not set up their territories until after the females give birth. 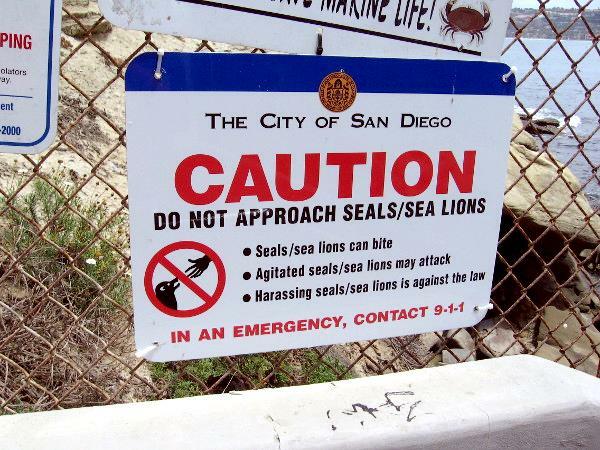 Most fights occur during this time. 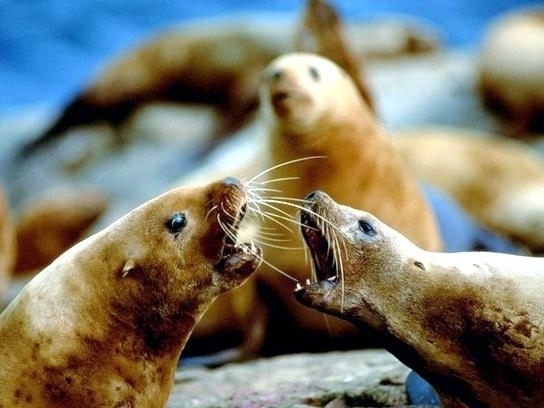 Soon, the fights go from violent to ritualized displays such as barking, roaring, head-shaking, stares and bluff lunges. 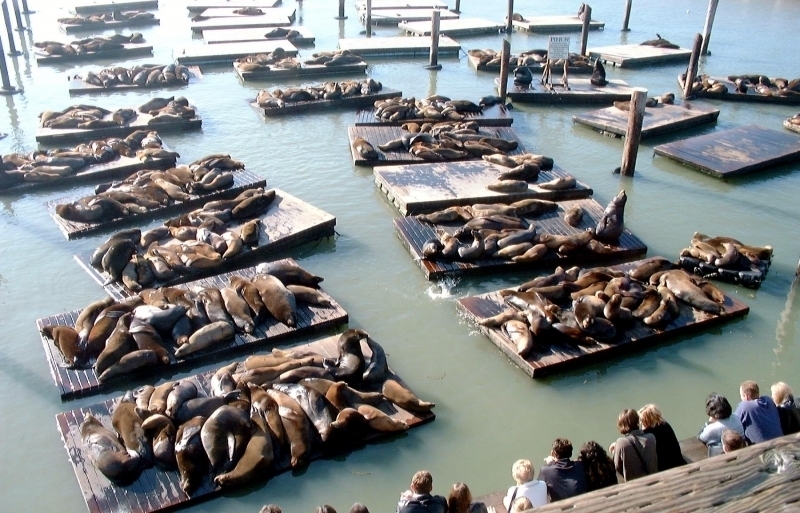 There can be as many as 16 females for one male. 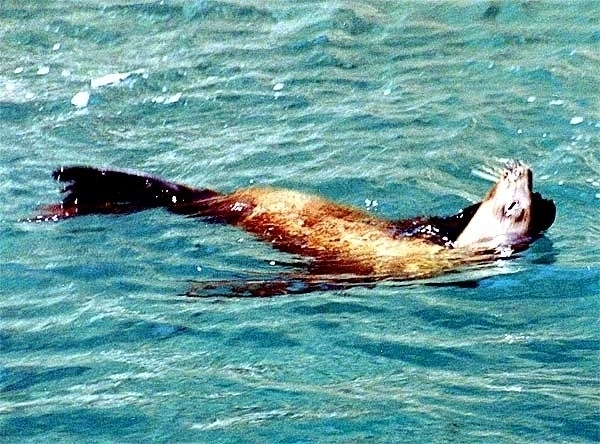 For adult males, territorial claims occur both on land and underwater. 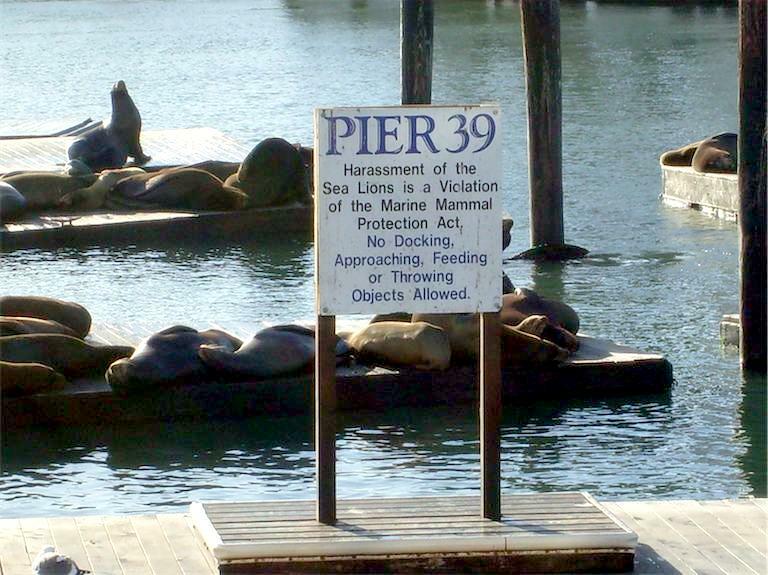 They have even been known to charge divers who enter their underwater territory. 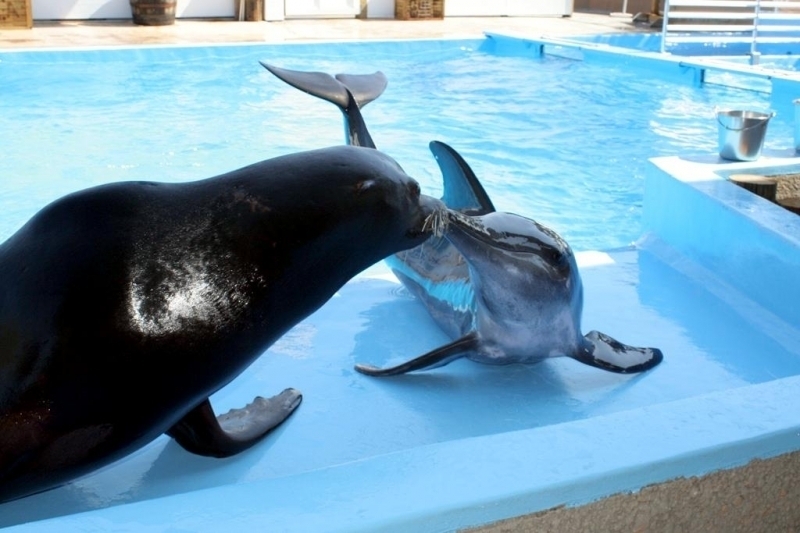 The females have a 12-month reproductive cycle, 9-month actual gestation with a 3-month delayed implantation of the fertilized egg after giving birth in early to mid-June. 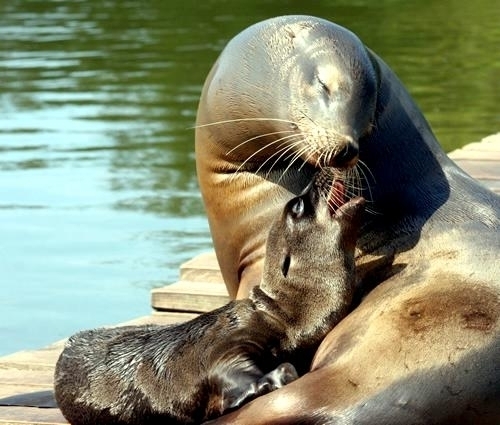 Mothers may give birth on land or in water. 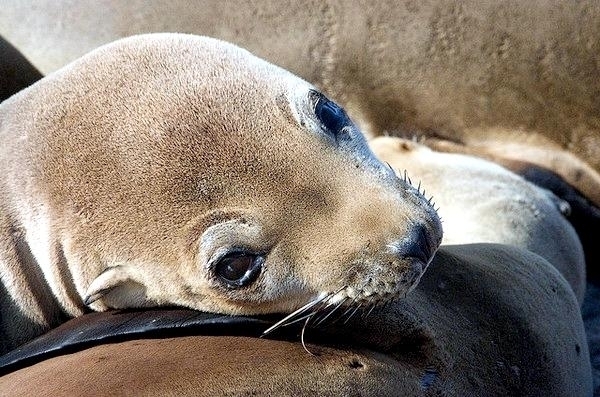 The pups are born with their eyes open and can vocalize with their mothers. 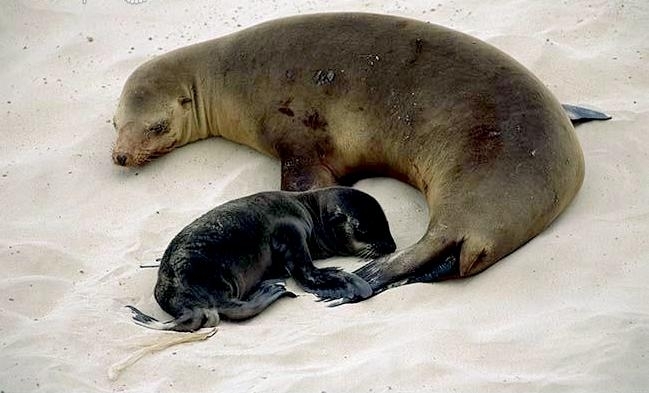 Pups may nurse for up to 6 months and grow rapidly due to the high fat content in the milk. 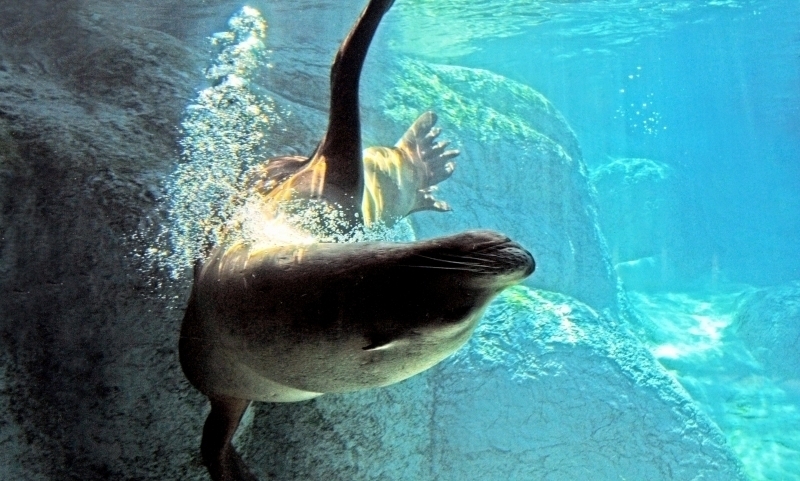 California Sea Lions along with other otariids and Walruses, are possibly the only mammals whose milk does not contain lactose. 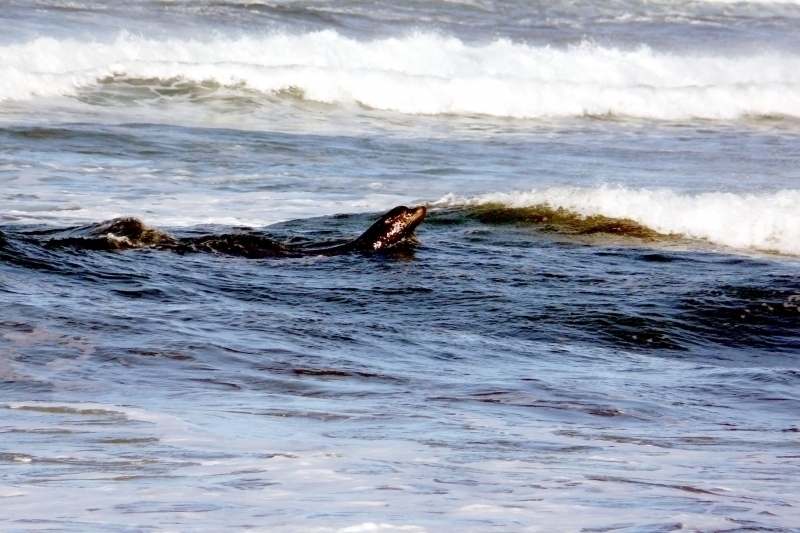 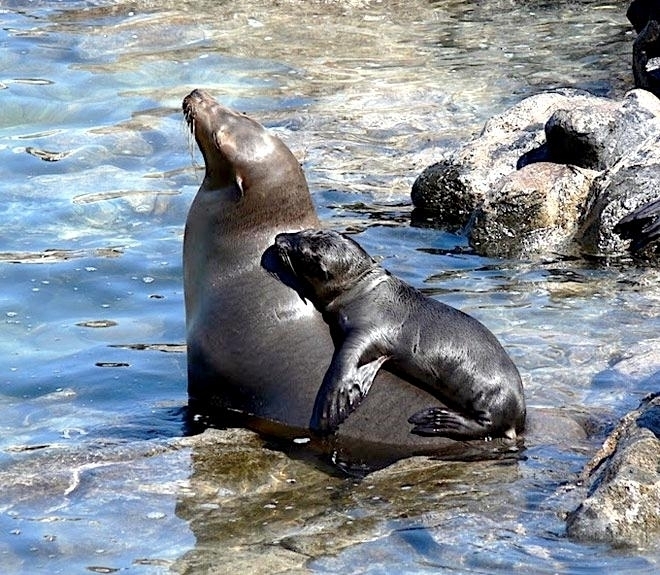 At about 2 months, the pups learn to swim & hunt with their mothers. 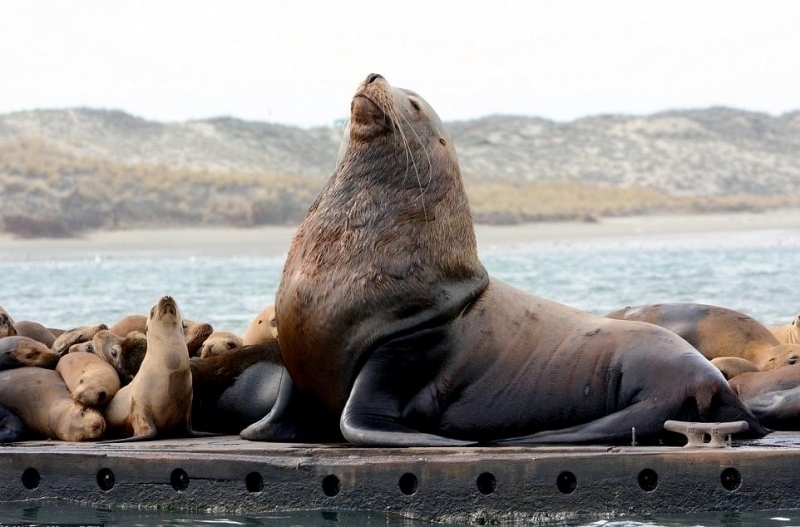 After the breeding season, female California Sea Lions normally stay in southern waters while the adult males and juveniles generally migrate north for the winter. 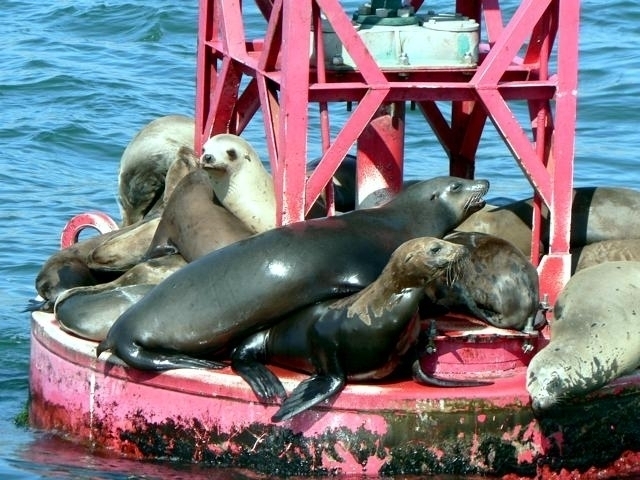 Social organization during the non-breeding season is unstable. 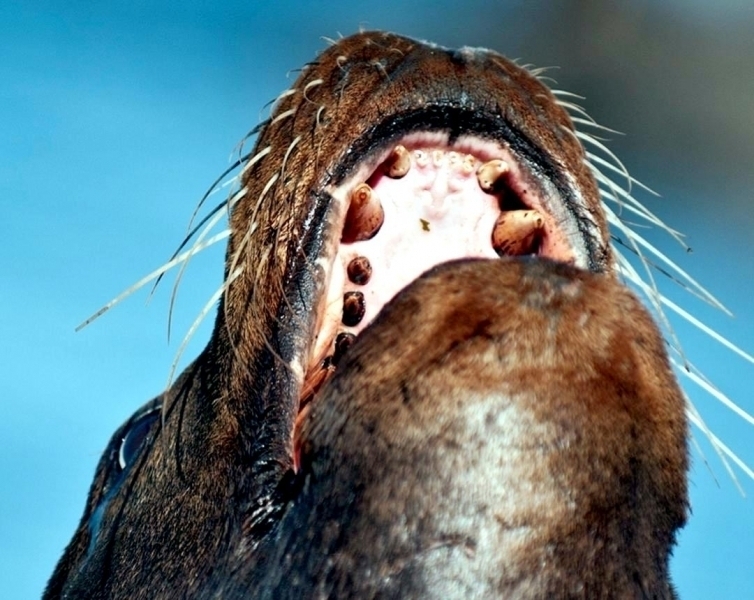 However, a size-related dominance hierarchy does exist. 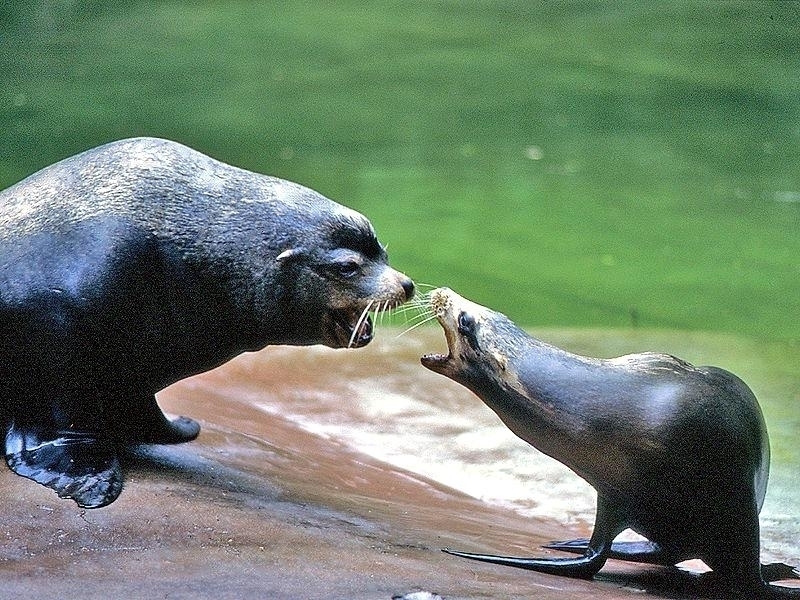 Large males use vocalization & movement to show their dominance and smaller males always yield to them. 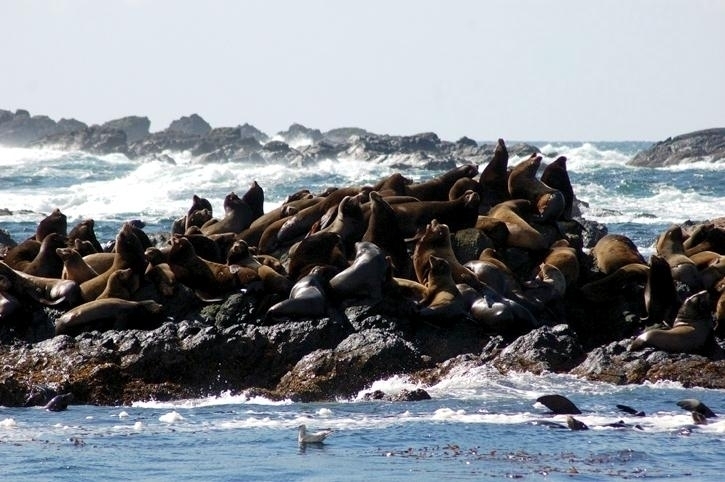 Non-breeding groups are gregarious on land and often squeeze together. 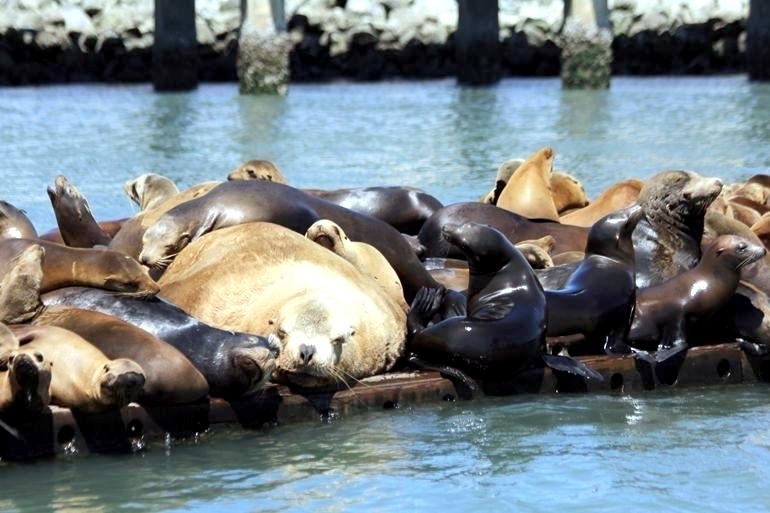 Most California Sea Lions found in man-made environments are males or juveniles, because they don’t breed there and it is mostly those groups that migrate to those places during the non-breeding season. 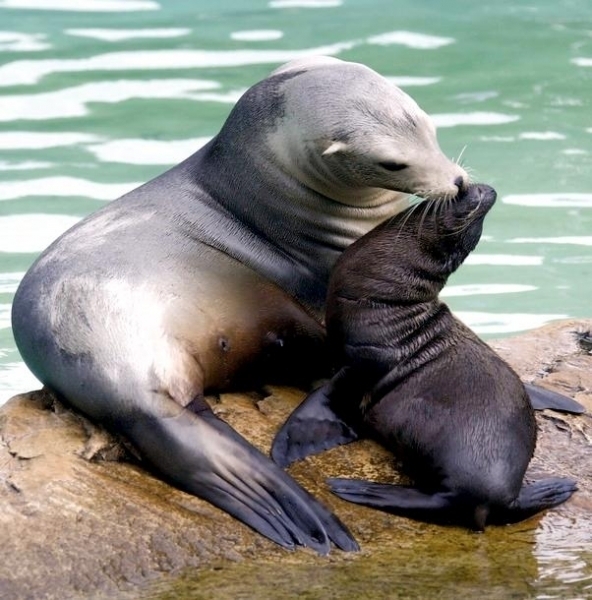 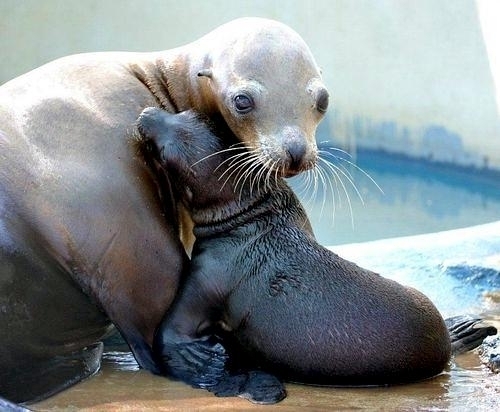 California Sea Lions are protected under the Marine Mammal Protection Act in the United States. 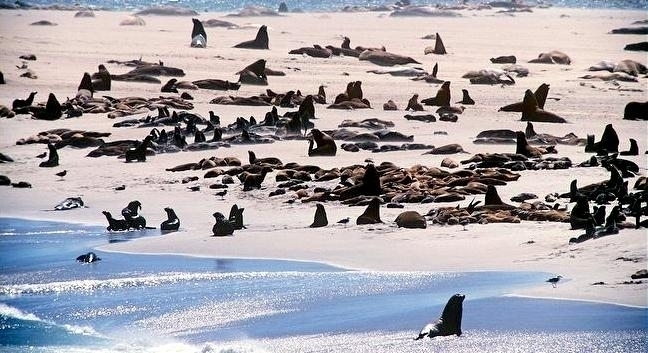 However their population has been increasing and conflicts with humans & other wildlife has increased. 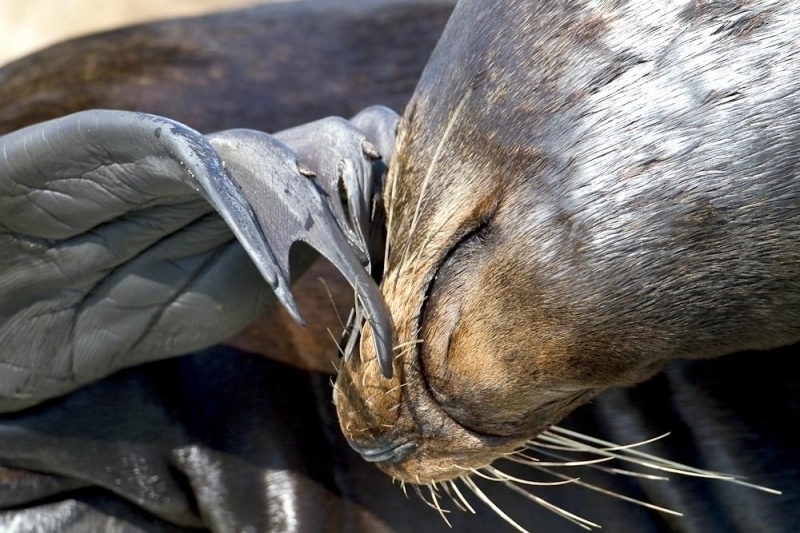 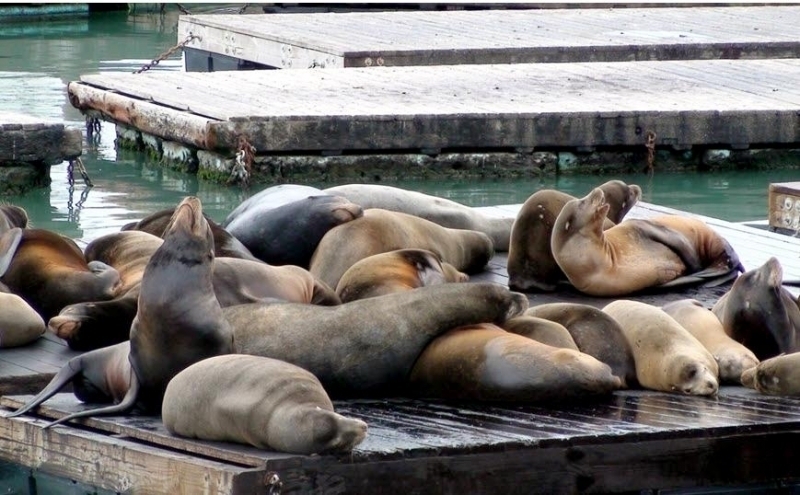 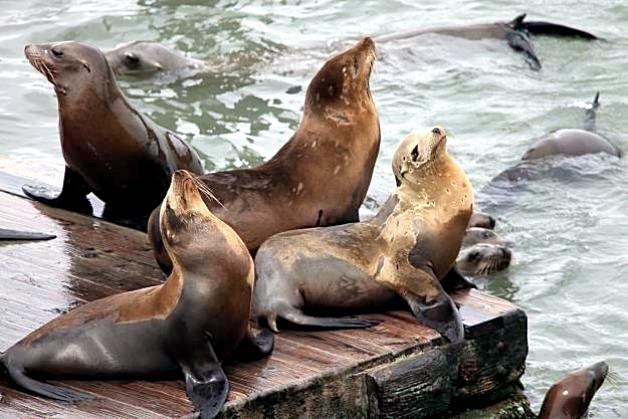 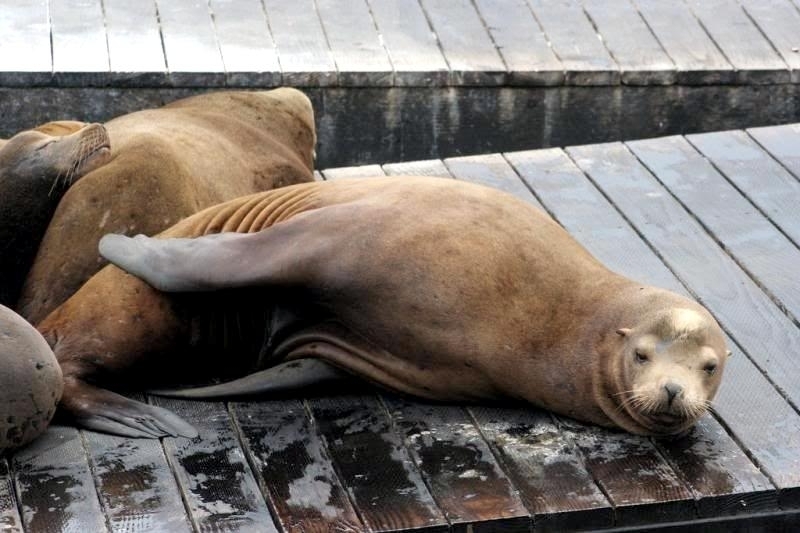 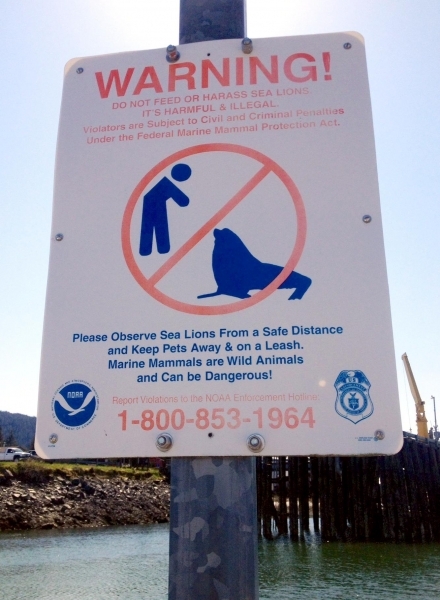 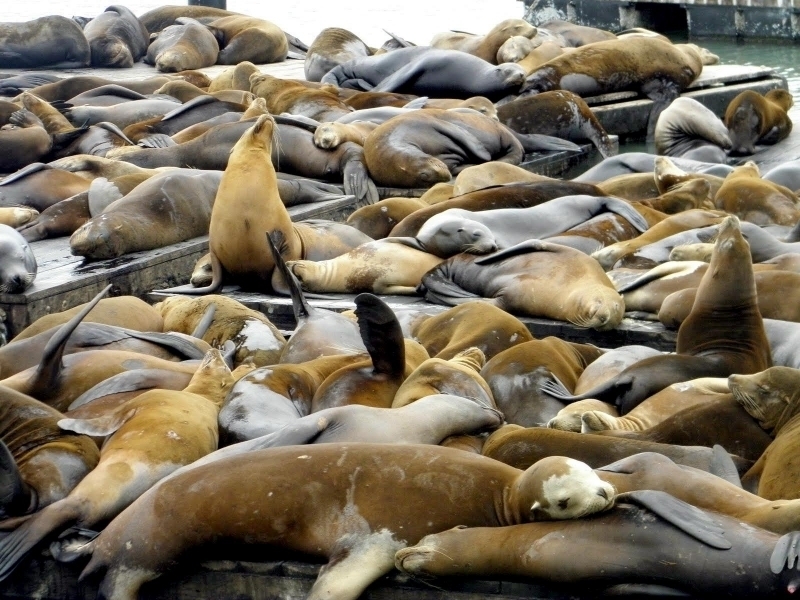 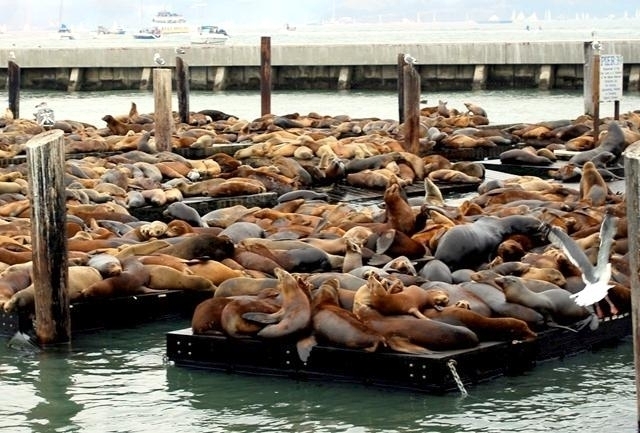 California Sea Lions have damaged docks & boats, stolen fish from commercial boats and have attacked & injured swimmers in San Francisco Bay and because of this, they have been shot at by locals and fishermen.